Washington Monthly | Is Reduced Enforcement Leading More Americans to Smoke Pot? Is Reduced Enforcement Leading More Americans to Smoke Pot? The number of arrests for marijuana possession is often thrown around as if it had some inherent meaning, e.g., that if the number goes up year-on-year the police must really be cracking down. But a rising number of arrests can mean that enforcement intensity is lessening if the prevalence of the underlying offence is increasing even faster, and a declining number of arrests can betoken increasing enforcement intensity if the underlying offence is declining in prevalence even faster. Also, the same number of arrests has a different meaning for crimes with different prevalence: 1,000 arrests a year in a big city represents aggressive enforcement if the arrests are for homicide, minimal enforcement if the crime is marijuana possession. Fortunately, readily available federal data allow us to look at marijuana arrests in light of how many people use the drug and how use trends are changing over time. In the chart above, the red line is marijuana possession arrests reported to the FBI and the green line is aggregate days of marijuana use reported by respondents to the National Survey on Drug Use and Health. The full picture is of marijuana enforcement intensity swooning for a long time, well before any states formally legalized recreational markets. Let me elaborate on why I agree with Beau’s pithy response. For a behavior to be deterred, there has to be a reasonable likelihood of punishment. 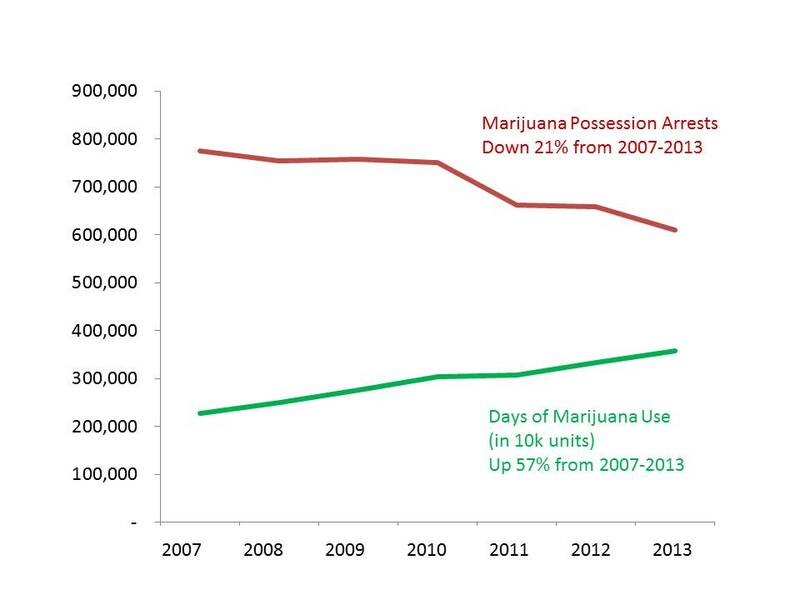 Even before enforcement intensity began to plummet, the risk of being arrested for smoking marijuana was very low. For the recent enforcement drop to have cause the increase in marijuana use, people would have had to notice when a once a week pot smoker’s risk of arrest dropped from once every 50 years to once every century. That’s not a sufficiently noticeable difference in the deterrent power of enforcement to be driving such a dramatic change in use. Making a drug illegal deters use by raising prices, because prices go up everywhere when a business cannot operate legally. Higher prices are deterrent because, unlike police, they really can be everywhere. Routine enforcement of prohibition is needed to sustain that economic effect, but beyond that, ramping up arrests does little or nothing to deter a behavior as prevalent as pot use (If you are interested in the academic research behind that point, this book is a good starting point). If you want to read more about the above data and hear more of what I learned when I interviewed Beau, check out my latest piece at Washington Post’s Wonkblog.